A while back we wrote about an Unity plugin that allows you to move the Unity 3D Launcher to the bottom of the screen which you had to manually install and had a few annoying bugs. Paullo, the Unity Bottom Launcher developer, has fixed the most important bugs (like the unmaximized Dash design, drag'n'drop items from Dash to the launcher, etc. ), created a stand-alone Unity plugin plugin called "Ubuntu Unity Plugin Rotated" and uploaded it to a PPA so it's easier to stay up to date with newer versions. This also means that the package now works on 64bit too. 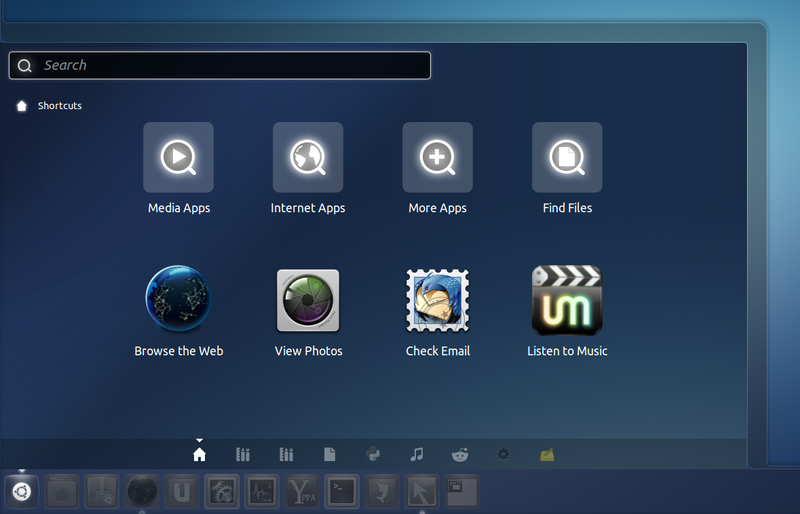 the Compiz expo plugin displays a gap on the left where the Unity launcher used to be. If you press ALT + F2 and then type "about:config", the default Unity plugin settings will be displayed instead of Unity Plugin Rotated. If you're a developer and want to check out the source code, see https://code.launchpad.net/~paullo612/unity/unityshell-rotated. Enabling the Unity bottom launcher plugin ("Unity Plugin Rotated") is tricky and can cause your whole Unity not to load if not done properly so make sure you know what your are doing and how to get Unity back in case it no longer loads before proceeding!! Most probably CCSM will freeze after enabling the plugin! (I've included a work-around, but other things besides those I've encounter could go wrong!). 3. Read the whole instructions below before proceeding! 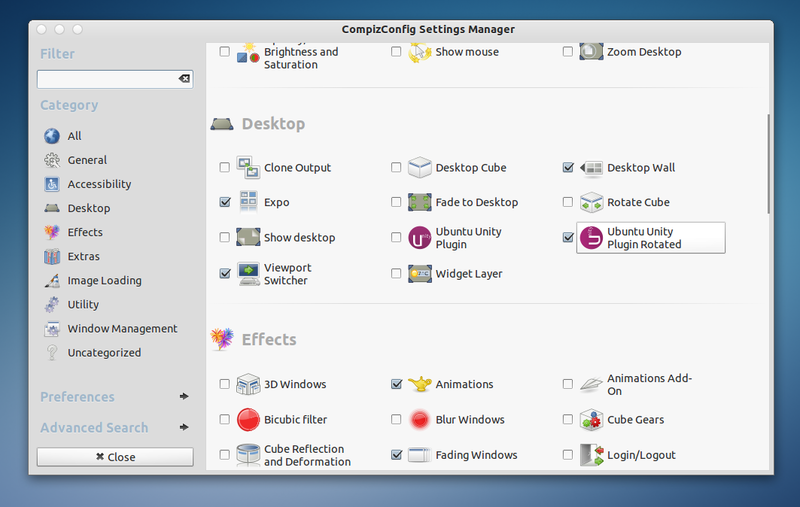 Open CompizConfig Settings Manager, disable the "Ubuntu Unity Plugin" and enable "Ubuntu Unity Plugin Rotated". When activating Ubuntu Unity Plugin Rotated, you might get a popup that there are some conflicts - here, select "Resolve conflicts" and for the next two popups, select "Disable Run Dialog" and "Disable Flip Down". Then log in as usual. And enable "Ubuntu Unity Plugin Rotated". To undo these changes, all you have to do is disable the "Ubuntu Unity Plugin Rotated" plugin and re-enable the "Ubuntu Unity Plugin in CompizConfig Settings Manager. If you can't enable the original Ubuntu Unity Plugin, see the "Important" part above. 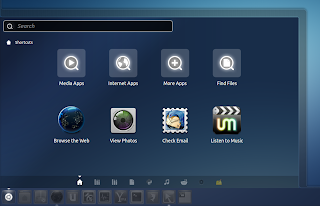 Thanks to Paullo @ http://forum.ubuntu.ru for his work on the Unity Bottom Launcher!